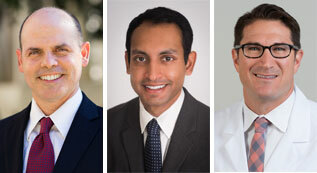 We are delighted to announce the appointment of three new faculty members to the UCLA Department of Urology. Dr. Dunn earned his undergraduate degree from the University of California, Irvine, and his medical doctorate from the University of Southern California. He completed his urology residency training at the University of Southern California. He then completed a fellowship in endourology and stones at Washington University in St. Louis. He then joined the faculty at LAC+USC, where he served for 18 years, the last five of which he was the Urology Residency Program Director. Dr. Dunn’s principal focus within UCLA Urology will be on the management of patients with kidney stones. He will practice endourology, percutaneous and extracorporeal lithotripsy, and general urology. He will lead our efforts to develop a unified stone program, advancing clinical care, training, and scholarship with a focus on value-based care redesign. For appointments please call 310-794-7700. Dr. Patel earned his undergraduate degree and medical doctorate from the University of Arizona and completed his urology residency training at the University of California, San Diego. He then completed a fellowship in endourology and stones at the Cleveland Clinic. Dr. Patel’s principal focus will be on the management of patients with kidney stones. He will practice endourology, percutaneous and extracorporeal lithotripsy, benign laparoscopy and robotics, and general urology. He will work to build and enhance our stone program in collaboration with Dr. Matthew Dunn, Director of Endourology and Stones. For appointments please call 310-794-7700. Dr. Kaplan earned his undergraduate degree from Claremont McKenna College and his medical doctorate from Tel Aviv University. He completed his urology residency training at UCLA. He completed a fellowship in Healthcare Leadership and Strategy at UCLA Health and is earning his MBA from the UCLA Anderson School of Management. His academic focus is in value-based care redesign. Dr. Kaplan will serve at the Martin Luther King, Jr., Community Hospital and its affiliated practice group, where he will work directly with Dr. Stanley Frencher. He will soon provide outpatient care at the Los Angeles County Department of Health Services Martin Luther King, Jr., Outpatient Center. Drs. Dunn, Patel and Kaplan will each serve in all aspects of executing the mission of UCLA Urology: to improve urological health and health care, we seek to create world leaders in urological health and science, discover the basis for urological health and cures for urological disease, optimize urological health through community partnerships, and heal humankind one urological patient at a time.